A common trend today is to get metal roofing installed on your home. Even home owners with asphalt shingle roofs consider getting metal installed simply because they like the look and style of metal roofing. There are advantages and disadvantages to using metal roofing when compared with asphalt shingles which I’ll go over later in this article. But, most home owners want to know if they can add a metal roof over shingles that are already installed on their homes. Unfortunately, there is no definitive answer and each case or home is different. I’ll go over some of the things that can affect the installation of a metal roof over shingles below. Installing a metal roof during the initial construction of your home isn’t much different than installing shingles. In fact, roof decking is placed on the structure to give it more rigidity. Without the decking on the roof, which is standard on all shingle roofs, the roof would be extremely noisy and during a torrential rain it’s unlikely you’ll even hear your television. Here at Livingston Roof Pros we can install both metal roofing and shingle roofing. Can Metal Roofing Be Placed Directly On Top of Shingles? This is a question that many people are looking for because metal roofing can grown so popular lately. Shingle roofs have been around for some time and home owners wanting to make the switch wonder if they should have the old shingles removed. And the answer is, well, it depends. It depends on many factors. Most of these factors will deal with the condition of the existing roof. A roof inspector will need to look at your current roof to determine if you can add a metal roof over shingles on your home. So What Does a Roof Inspector Look For? The first thing that the roof inspector will look at when they arrive at your home is how level the roof is. Sometimes the structural frame of the roof starts to sag and even warp in some cases. It’s much less noticeable on a shingle roof but would be extremely noticeable on a metal roof. Any sort of waves, dips, or rises will need to be examined because adding a metal roof over shingles that are not level will certainly show in the new metal roof. In fact, the seams may not even seal correctly if the problems are too bad. Other problems that may stop you from placing metal over shingles roof is problems with the roof decking. If your current roof was leaking and water has penetrated into the decking it may have made it weak. This would mean it may not be able to support the new metal. Although the metal is much less weight than shingle counterparts, it’s also easy to get blown away. Wind can rip the metal roofing from the home if it’s not securely fastened. A common installation tactic for adding metal roof over shingles is to add small slats of wood and secure those slats of wood to the roof decking. These slats of wood run perpendicular to the metal roofing itself. The metal roofing is then secured to these slats of wood on the roof. This method does not require you to remove the asphalt shingles from the roof. However, you may still see some of the imperfections in the roof as far as dips and rises. These types of imperfections are much less noticeable with asphalt shingles. 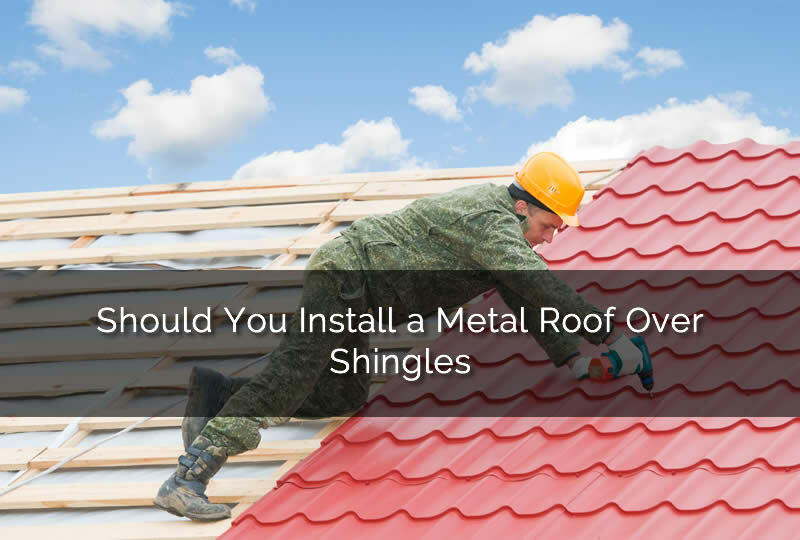 The only way to know for sure if you’ll be able to install a metal roof over shingles already installed is to have the roof inspected by a licensed roofing contractor. Here at Livingston Roof Pros we can add a new metal roof to your home over the old shingles. But we’ll first consult with you to let you know of the problems that you might face. We can also give you a free roof estimate in Livingston Michigan. Be sure to contact us today at 517-940-8770. These factors should be kept in mind while installing a roof. Thanks for the differentiation. Nice comparison and Ideas regarding on selecting the best roofs to be installed. In my end if I can afford the best one then I’ll go for it.